On this date in 1659,* the Mughal Emperor Aurangzeb disposed of his primary competition … his older brother Dara Shukoh or Shikoh. These two sons of Taj Mahal builder Shah Jahan were the principal contenders in a fratricidal four-way civil war for the Peacock Throne. We’ve previously covered this time of troubles via the execution of yet another of the brothers here. But if the old man had had his way, Dara would have been the winner. 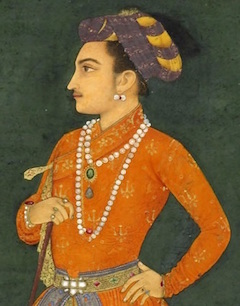 For many years it was the firstborn who had been painstakingly positioned as the heir, not excluding possession of the Mughal capital — a circumstance which helped to goad the envious brothers into rebellion when Shah Jahan’s illness threatened to make Dara’s succession a fait accompli. secured on an elephant; his young son, Sipah Shikoh, placed at his side, and behind them, instead of the executioner, was seated Bahadur Khan [one of the royal generals]. This was not one of the majestic elephants of Pegu or Ceylon, which Dara had been in the habit of mounting, pompously caparisoned, the harness gilt, and trappings decorated with figured work; and carrying a beautifully painted howdah inlaid with gold, and a magnificent canopy to shelter the Prince from the sun: Dara was now seen seated on a miserable and worn-out animal, covered with filth; he no longer wore the necklace of large pearls which distinguish the princes of Hindoustan, nor the rich turban and embroidered coat; he and his son were now habited in dirty cloth of the coarsest texture, and his sorry turban was wrapt round with a Kashmir shawl or scarf, resembling that worn by the meanest of the people. Such was the appearance of Dara when led through the Bazars and every quarter of the city [of Delhi]. I could not divest myself of the idea that some dreadful execution was about to take place, and felt surprise that government should have the hardihood to commit all these indignities upon a Prince confessedly popular among the lower orders, especially as I saw scarcely any armed force. The people had for some time inveighed bitterly against the unnatural conduct of Aureng-Zebe: the imprisonment of his father, of his son Sultan Mahmud, and of his brother Murad Bakhsh, filled every bosom with horror and disgust. The crowd assembled upon this disgraceful occasion was immense; and everywhere I observed the people weeping, and lamenting the fate of Dara in the most touching language. I took my station in one of the most conspicuous parts of the city, in the midst of the largest bazar; was mounted on a good horse, and accompanied by two servants and two intimate friends. From every quarter I heard piercing and distressing shrieks, for the Indian people have a very tender heart; men, women, and children wailing as if some mighty calamity had happened to themselves. Javan Khan [a Pathan who betrayed Dara into Aurangzeb’s hands] rode near the wretched Dara; and the abusive and indignant cries vociferated as the traitor moved along were absolutely deafening. I observed some faqirs and several poor people throw stones at the infamous Pathan; but not a single movement was made, no one offered to draw his sword, with a view of delivering the beloved and compassionated Prince. When this disgraceful procession had passed through every part of Dehli, the poor prisoner was shut up in one of his own gardens, called Haidarabad. Aureng-Zebe was immediately made acquainted with the impression which this spectacle produced upon the public mind, the indignation manifested by the populace against the Pathan, the threats held out to stone the perfidious man, and with the fears entertained of a general insurrection. A second council was consequently convened, and the question discussed, whether it were more expedient to conduct Dara to Gwalior, agreeably to the original intention, or to put him to death without further delay … it was ultimately decided that Dara should die, and that Sipah-Shikoh should be confined in Gwalior. At this meeting Raushanara Begam [Dara and Aurangzeb’s sister] betrayed all her enmity against her hapless brother, combating the arguments of Danishmand Khan, and exciting Aureng-Zebe to this foul and unnatural murder…. That’s not the way to get a-head! Aurangzeb contemplates his fratricidal trophy. Via dara-shikoh.blogspot.com, which has many other illustrations of Dara’s career. 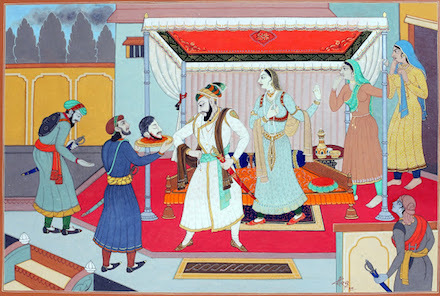 Dara’s daughter was taken that same evening to the saraglio, but afterwards sent to Shah-Jahan and Begam-Sahib; who begged of Aureng-Zebe to commit the young Princess to their care. Dara’s wife, foreseeing the calamities which awaited her and her husband, had already put a period to her existence, by swallowing poison at Lahor. Sipah Shikoh was immured in the fortress of Gwalior; and soon after these tragical events Javan Khan was summoned before the council, and then dismissed from Dehli with a few presents. He did not escape the fate, however, which he merited, being waylaid and assassinated in a forest, within a few leagues of his own territory. This barbarian had not sufficiently reflected, that though tyrants appear to countenance the blackest crimes while they conduce to their interest, or promote a favourite object, they yet hold the perpetrators in abhorrence, and will not scruple to punish them when they can no longer be rendered subservient to any iniquitous project. The cultured Dara cuts a charismatic figure for posterity, and given that the Mughal Empire fell into precipitous decline after Aurangzeb — opening the way for British colonization — some can’t help wondering whether India’s destiny could have been entirely different had Dara successfully followed his father to the throne. * September 9 on the Gregorian calendar; the equivalent Julian date of August 30 is also commonly reported. Sambhaji was the firstborn son of the man whose daring had created the Hindu Maratha state — and whose death in 1680 seemed to the neighboring Muslim Mughals the right invitation to destroy this nascent rival. The Mughals were right to worry, for in the 18th century the Maratha polity would grow into an empire dominating the Indian subcontinent, and drive the Mughals into a long decline. But in the 1680s, it was the Maratha on the back foot as Aurangzeb invaded their haunts on the Deccan Plateau, steadily albeit very slowly reducing Maratha fortresses over the course of the decade (and the next decade). This war defined Sambhaji’s reign, and ended it too, when he was at last captured with his favorite aide Kavi Kalash in Sangmeshwar. Mockingly dressed up as buffoons, they were paraded through Mughal territory to the emperor, who would present them a demand for Islamic conversion as the price of their lives. 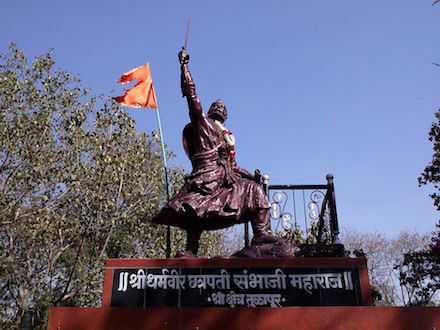 Sambhaji has not been highly rated for his indifferent internal governance of Maratha, but the clarifying allure of war and the gruesomely patriotic manner of his death earned him hero’s laurels still honored by Hindu nationalists down to the present day; the village of Tulapur where he was put to death honors Sambhaji with several monuments. 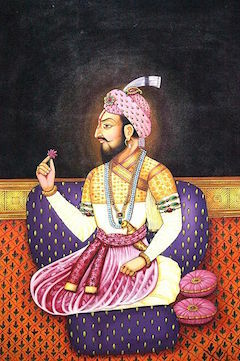 For a contemporary — like, say, Aurangzeb — Sambhaji’s death followed closely by the capture of his family when the Maratha capital succumbed to Mughal siege must have appeared to presage the destruction of his state. Things didn’t work out that way: Sambhaji’s younger brother Rajaram and especially Rajaram’s impressive queen Tarabai kept the Mughals bogged down on the Deccan, bleeding money** and time as they struggled to complete the conquest — until by Aurangzeb’s own despondent death in 1707, it was the Maratha on the advance, and the Mughal Empire on the brink of its own collapse. * Aurangzeb was the son of the man who built the Taj Mahal. He’d needed some violence of his own to claim the Mughal throne from his brothers. There’s blood in the stones … (cc) image from Vil Sandi. Despite writing into stone a love to transcend time, Shah Jahan had the monarchy’s eternal managerial challenge: succession. This ought not have surprised him. Jahan himself had been a third son, who took his own power by rebellion and clinched it by fratricide. 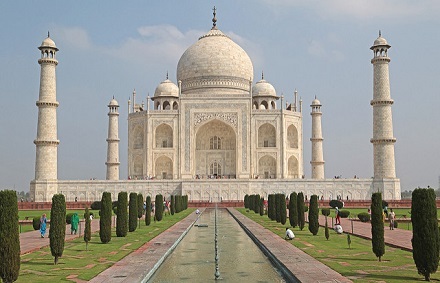 And through the empress to whom Jahan would dedicate the Taj, Mumtaz Mahal, Shah Jahan had four sons who all thought they like their illustrious dad deserved the helm of the wealthy Mughal state. In descending order of age, those rivalrous brothers were: Dara Shikoh,** Shuja, Aurangzeb, and our man Muhammad Murad Bakhsh. As we open the scene, each governs a portion of the father’s empire; by the end of this post, Aurangzeb will be emperor — his reign to span nearly a half-century — and his brothers will be all be dead. The oldest boys had the first go, with Dara Shikoh’s power as the officially designated regent of the incapacitated Jahan challenged quickly by Shuja, who was governor of Bengal. Shuja decared himself emperor and marched on Dara Shikoh, who turned little brother aside. The two were soon forced to come to terms with one another as the younger brothers, Aurangzeb and Murad, had combined their own forces — and the youth had their say in May 1658, smashing Dara Shikoh at the Battle of Samugarh. Murad is credited in this watershed battle with a decisive charge, personally slaying the enemy second-in-command using a composite bow. This fight made Aurangzeb emperor; Dara fled for Afghanistan but was caught and killed a few months later. (Shah Jahan, still living, was confined comfortably but sorrowfully by Aurangzeb.) In January of 1659, Aurangzeb put down Shuja’s challenge at the Batte of Khajwa. 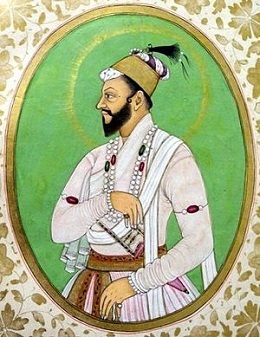 Having wagered the Peacock Throne in battle twice for the honor of supplanting his elders, Aurangzeb had a more expedient solution to sweep away his last potential rival. On arriving at Muttra (Mathura) Aurangzeb threw off the veil that he had worn with Murad. That brave but savage Prince was arrested while suffering from the effects of a carouse, and sent in all secrecy, a prisoner, to Dehli, where he was confined in the Salimgarh, a fort near the palace. Murad would be put to death a couple of years later via the instrument of a murder charge supplied by the family of a courtier whom Murad had previously killed. * The equivalent date on the Julian calendar, December 4, is also sometimes reported. ** The name means “as magnificent as Darius,” which is the sort of conceit destined to set a body up for disappointment. The Mughals executed the ninth of those Gurus on this date in 1674. Guru Tegh Bahadur (the name means “Hero of the Sword” and was earned in youthful battles against those same Mughals) was acclaimed above 20-odd other aspirants after the previous Guru died saying only that the next guy was in the village of Bakala. 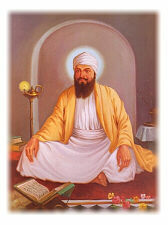 Guru from 1664, he’s noted for founding the holy city of Anandpur Sahib in Punjab. And it was his lot to lead a minority faith during the reign of the Aurangzeb, an emperor notorious to posterity for religious dogmatism. He’s known best as a persecutor of Hindus: knocking over temples to throw up mosques, forcing conversions, and implementing sharia. But Aurangzeb knew how to get after all kinds. Considering the going sectarian tension between Hindu and Muslim in the environs, there’s a good deal of touchy historical debate over just how to characterize Aurangzeb’s policies. This site is entirely unqualified to contribute to that conversation but suffice to say it was not an ideal moment to adhere to an alternate faith. The circumstances of Guru Tegh Bahadur’s capture, and his subsequent execution in Delhi, are similarly obscured by hagiography. Aurangzeb, who spent his reign at virtually continual war, must surely have seen in the Guru’s capital city — which also welcomed Hindu refugees fleeing the Mughals’ abrogation of their rites — a nest of rebellion. Putting its leader to death when he too refused conversion would have been right in character; no less understandable is the Guru’s remembrance as a martyr to religious liberty, and not only the liberty of Sikhs but Hindus, Buddhists, and any other comers. Tegh Bahadur’s nine-year-old son Gobind Singh succeeded as the tenth and last Guru. It was he who laid down the “Five Ks” — five articles that a faithful Sikh should wear at all times. Thanks to the parlous state of security vis-a-vis the Mughals, one of those items is the Kirpan, a dagger or small sword that continues to vex airline security agents down to the present day. * Ten human Gurus: the tenth passed succession to the perpetual “Guru Panth” (the entire community of Sikhs) and “Guru Granth Sahib” (a sacred text).